. . . We can Restore your Family's Furniture Treasures . . Everything Wood! . .
* * Sparta, Red Bud, Greenville, Carterville, Benton, and All Towns in between. . Repairing . Enhancing . Refinishing . Let Us Refinish Your Old Furniture so you Love it Again. Let us Enhance Your not-so-old Furniture so You Love it again. 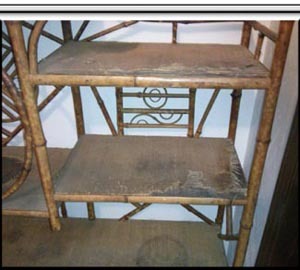 Here are a few examples of our furniture restoration. Call: 618-246-6146. All furniture stripping and furniture refinishing worked by hand, No Dipping Here. Yes - Black Carpenter Ants were eating it up. with a new walnut top. I believe it was perhaps an Organ at one time. 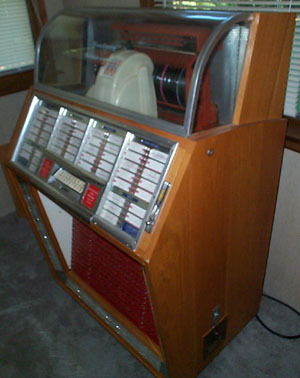 This is a Seeburg 100 - First Juke Box to play 45 records. The Juke Box that basically started the downfall of the Werlitzer. It was a mess too. The cabinet was completely rebuilt with solid oak. The coin door was replaced with an old brass post office box door. 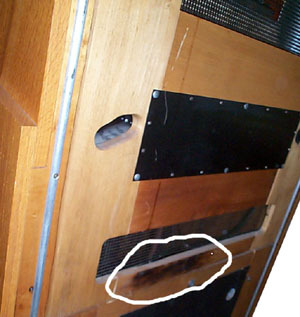 The original top board of the Juke Box was burnt. Perhaps some Tequilla was spilled and a cigarette ignited? Whatever the reason I thought the burn was cool. and put it on the back. It is circled in white in the picture. It was bought at a closed bar outside Centralia, IL. and currently resides in a Washington, County home. 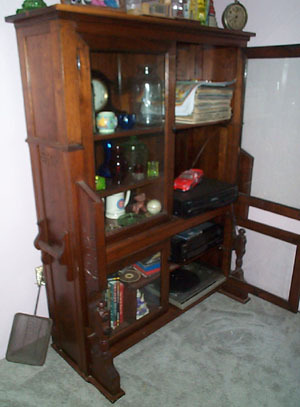 Here is a very Old Cane Shelf. 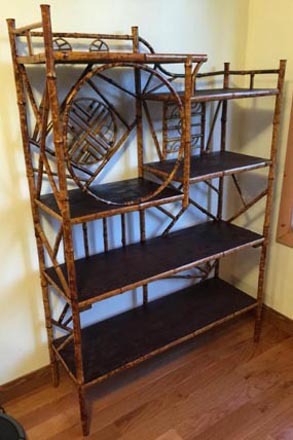 covering each shelf is worn. and All Towns around Southern Illinois. Please Call for a Free Quote. 618-246-6146.